Why the Climate Change/Peak Oil/Transition Movement Needs Mr. T.
I was in London over the weekend, seeing a concert at the Alexandra Palace by the utterly wonderful Sigur Ros, which was indeed utterly wonderful. The next day, en route home, we went to Camden Market, and my eye was caught by this great T-shirt on one of the stalls. 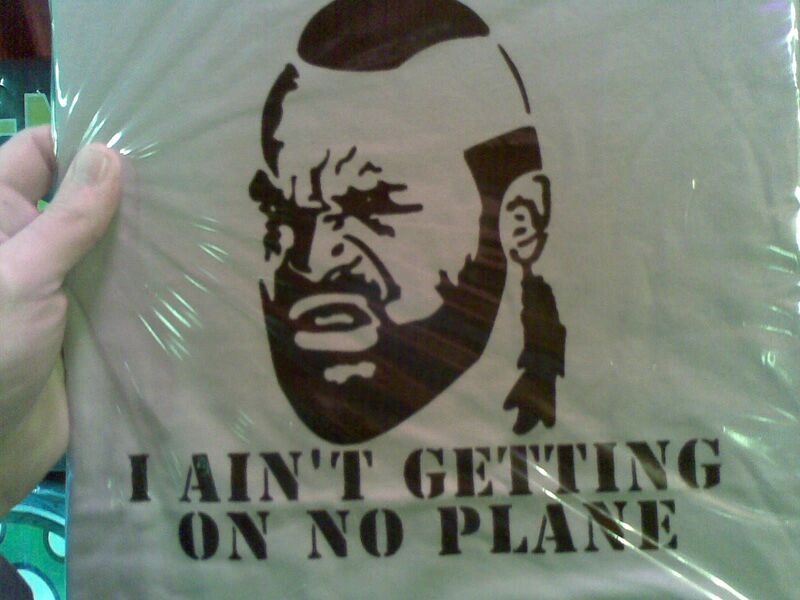 I had never considered Mr T a hero of the no-fly movement, but of course “I ain’t getting on no plane” was one of his catchphrases. Unfortunately Mr T wasn’t motivated by climate change, nor by the results of the Oil Vulnerability Audit he did for the A-Team’s activities, rather a sheer terror of setting foot on aircraft (something to do with his Vietnam experiences). Each episode of ‘The A-Team’ that required them to fly somewhere usually had a scene where one of them would tell Mr T that they had to fly somewhere, to which he would reply “I ain’t getting on no plane, fool”. At that point they would tell him that they were fully aware of that, which was why 20 minutes earlier they had dosed his lunch with crushed up sleeping pills, and 30 seconds later he would dutifully keel over backwards at which point they would carry him to the plane and put him in the hold. It might have been more impactful had he said “I ain’t getting on no plane. Do you know that if we fly to Auckland we will use aviation fuel 9.14 times my bodyweight, with carbon implications of over 9 tons? For heavens sake guys, don’t you read James Hansen’s papers? Sorry, but if these jobs you keep arranging for us can’t be reached by public transport you’ll have to count me out. Fool”. Tricky, I imagine, to be an underground mercenary force with a low carbon footprint, but actually The A Team would be great to have on your side in the rapid Transitioning of your community, given their ability to do great appropriate technology with whatever they had lying around. In most programmes they would vanish into a shed for a few hours when it looked like all was lost, and build a tank out of welding together a lawnmower, some string and a few old dustbins, which was then used to whup the baddies. A machine to extract CO2 from the atmosphere and lock it up permanently? No worries. A desert reforesting device? Mr T’s working on it right now, should be ready before lunch, just don’t interrupt him, you know what his temper’s like. For anyone who hasn’t a clue what I’m on about, or for anyone who has just come over all nostalgic, you might want to check out the original trailer for The A Team. By the way, they didn’t have those T-shirts in my size, or I may well have been wearing one at the next talk you happened to see me at. After all those years watching the A-Team as a child, I never did find out what the T stood for. Perhaps, if a new series (given that remakes are all the rage these days) were able to focus more on his device building abilities in the post-carbon context, rather than duffing people up, we might then be able to assert that the ‘T’ stood for ‘Transition’? Take a look at this recent TV commercial he did, and consider how quickly we might get things moving in the world if Mr T was the US head negotiator at the upcoming Copenhagen climate talks. Come on Obama, you know it makes sense! Love the t-shirt, in fact I just swiped the photo for my Facebook profile! Survivors on BBC last night was pretty Transitiony too – no oil for cars, no way to charge mobiles etc. Of course it was Bosco Albert Baracus who wouldn’t get on no plane. Mr T is the actor who played BA – they had that whole suspension of disbelief thing going on. T stands for Tureaud, the actor’s surname. Now, if only the Transition Network had a theme tune as cool and joyful as The A Team’s, we’d really start seeing some energy descent. Much more important than encouraging people not to fly would be to encourage them not to have more than one child! A Mr T condom advert anyone? Tom, you might be pleased to see that even without a Mr T fronted advertising campaign, sales of Durex were up 45% this month…. I imagine one could just do a remake of the Snickers one, but with a large condom on the tank’s gun, and Mr T could thrown them at the guy too…. sigh… it’s been a long day, time to turn this thing off….